Chief Inspector Maigret sets a trap for a serial killer, which doesn't work quite as expected, but still eventually leads to the murderer, and more. 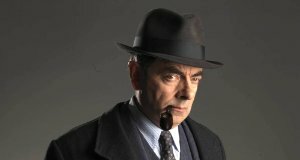 Rowan Atkinson plays Maigret. As in the 1992 series, the city of Budapest plays the city of Paris. Atkinson is cast against type here, I should say to a fault. I enjoyed the show, but Maigret is an extremely well-known character who has been played by many great actors (Charles Laughton, Jean Gabin, Richard Harris, Michael Gambon — just to name the other British ones), and Atkinson does not suggest Maigret. He is nervous when Maigret would be calm, anguished when Maigret would be stoically sad, and rude when Maigret would be polite. Maigret was large, while Atkinson, though tall, seems slight (Gambon is only an inch taller than Atkinson, but he seemed so much larger in the role). Maigret was comfortable with his size, his position, his bourgeois existence, and Atkinson never once seems comfortable with anything. I'm not saying it's a bad performance, it just isn't Maigret. It's fun for Doctor Who fans though: Atkinson played The Doctor in the non-canonical Doctor Who: The Curse of Fatal Death (1999), while Inspector Janvier is played by Shaun Dingwall (who played Rose Tyler's father) and Madame Maigret is played by Lucy Cohu (who played Captain Jack's daughter in Children of Earth).